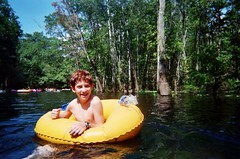 Since, based on web traffic reporting, there’s so much interest in Ichetucknee Springs tubing (and why shouldn’t there be? ), I thought I’d collect links to all my photos on the subject in one place. July 23, 2005 with my Mom and my brother’s family. July 30, 2005 with Dana (the most popular thing on this site). August 19, 2006 with my cycling club group (we rode and ate before we tubed). The first set of photos was taken with a Fuji waterproof disposable film camera with processing and scanning to cd-rom by a local lab. The latter two sets were taken with my old, reliable Canon PowerShot G1 inside an AquaPac case. Update (12 Aug 2007): Links to new tubing photo sets.